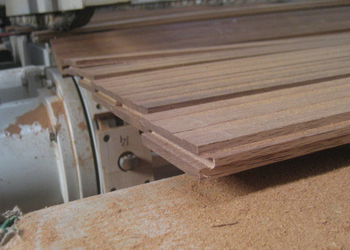 As the leading manufacturer & wholesaler specializing on acacia flooring ( both long leaf & short leaf ),our factory can do custom mill on acacia floor board with different specifications according to customer requests.Our production capacity is 8-10 x 20ft containers per Month for standard size acacia hardwood floor board (3", 3.75”& 5”width).Non standard size should be negotiated before orders due to the raw material limit in warehouse. Require no rot while allowing knot including dead knots and living knots, poles, crack , white edge etc. The detailed standards are: living knots diameter ≤20mm≤4, dead knots diameter≤4mm≤3, or a single dead knot diameter≤8mm, head crack diameter≤0.2mm long≤15mm≤1 or 0.5%, surface crack diameter≤0.2mm long≤40mm≤1, pole diameter≤ 1mm≤5, but decentralized arrangement is a must. All of the knots, poles, crack , white edge are required to be repaired in a correct method, and more importantly, only one defect is allowed among them. White edge is allowed for 1/3 of the plate length, 1/4 width, and does not allow oblique fissure. Require no rot while allowing knot including dead knots and living knots, poles, crack , white edge etc. The detailed standards are: no limit to living knots, dead knots diameter≤20mm, length >600mm≤3, length≤600mm≤2, pole diameter≤1mm≤8, but decentralized arrangement is a must. Head crack diameter≤0.2mm, length≤20mm≤2, surface crack diameter≤0.5mm, length≤70mm≤3, All of the knots, poles, crack , white edge are required to be repaired in a correct method, and more importantly, three defects are allowed among them. White edge is allowed. Worse than Grade B standard. 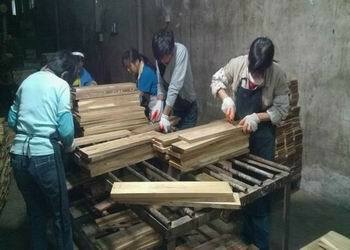 It can be used for the antique flooring production.